At Liberty Home Solutions we are proud to be offering Springfield, Joplin, Nixa, Ozark, Branson and the greater Ozarks area our safety shower line. What is a safety shower? 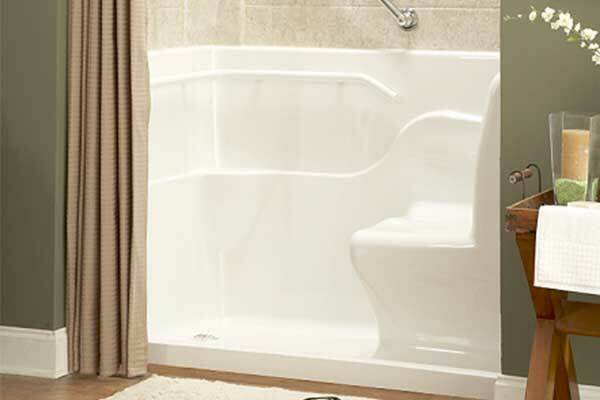 Think a shower with a seat, but with all the bells and whistles from our safety bathtub line. At Liberty Home Solutions we believe that there is not a reason anyone should have difficulties while showing with the ease and comfort of our safety shower system. This acrylic seated safety shower removes the obstacles of traditional showers and allows our customers the ability to simply enjoy a warm, safe, secure showering experience in the comfort of your own bathroom. Our safety showers are designed with state of the art safety features so our customers can be as independent as possible, but allow for anyone to use this shower with the normal ease of use that a traditional walk in shower provides. Never Scrub Again with Acrylic Bathroom Systems! The wide, full-sized, built-in seat is recessed in the front to allow you to pull your legs back and underneath you for easy, well-balanced standing or sitting, which means no more struggling to get up or down. Our Seated Safety Shower gives you the freedom to choose whether to sit or stand, so your showering experience is safe, comfortable and worry-free. 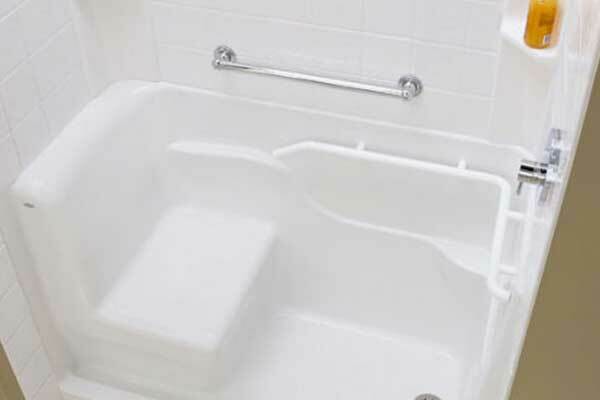 The innovative wrap-around grab bar, textured shower floor and industry low 3″ threshold adds even more security and further increases your bathing peace of mind. Every detail about Liberty Home Solutions acrylic Safety Shower is designed for your independence, safety, comfort and convenience. The seat also features a low 3″ threshold and a built-in wrap-around grab bar that allows you to always feel safe and confident, no matter if you’re standing, sitting, entering or exiting. Available in white or biscuit acrylic and left or right hand configurations, it can be completed with a traditional shower curtain or shower doors to match the look and feel of your current bathroom décor. The 60″ long Seated Safety Shower by Liberty Home Solutions can be installed into any standard tub or shower opening, making it an extremely convenient and easy addition to any bathroom. Our Safety Showers are constructed with freestanding metal support frame which gives the seated shower durable strength and strong support and makes it easy to install in any bathroom. You can complete the look and feel of your shower with a traditional shower curtain or shower doors to match the décor you already have in your bathroom. 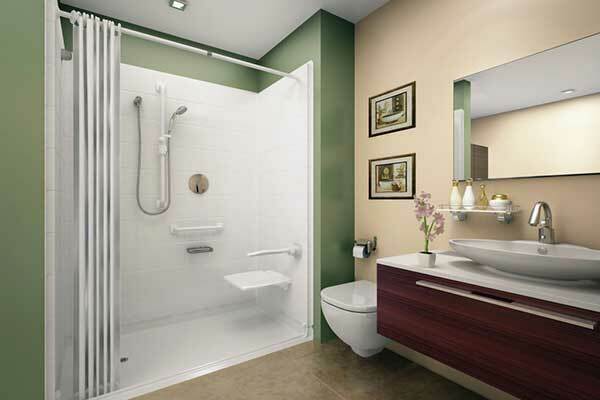 Safety Shower also comes with a built-in armrest for comfort and an accessory ledge for personal items. With the Liberty Home Solutions Safety Showers you are the designer, you get to choose your colors, finish, features and accessories. 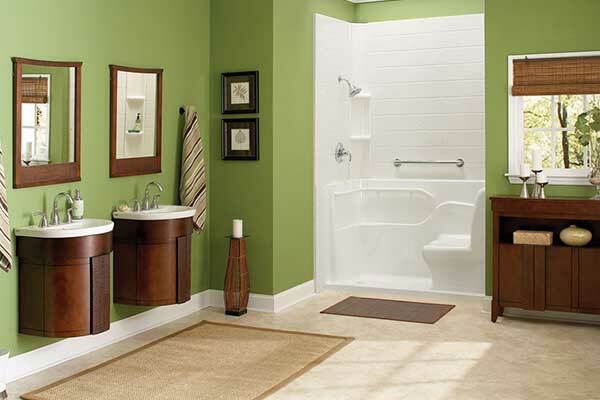 Because when it comes to your bathroom, we feel that you should be able to get exactly what you want. See Below and discover our texture style and color options. We have many different styles, textures, colors and accessories to choose from, allow us to showcase our options with a free in-home estimate or showroom appointment today! Schedule a FREE in-home estimate where we will showcase the ins and outs of our safety shower systems. Learn about the features, benefits and how this system might be the perfect fit for you and your family.We also would like the opportunity to prove how we can offer you the highest quality products, for less, how much less, try a $750 to start! Also you will receive a FREE Moen Fixtures Upgrade. Call or contact us now. I am handicapped and have been approved for a roll-in shower by the VA. I am interested in the shower on this page. I live by Hwy 14 and 95 in Gentryville. Would this be a problem? Thank you. Please call us at 417-889-3218 and we will be glad to help you.